Okay, here is a Chimaera's entry for 's contest. Edit: Added details to his eye patch, flowers on the long pillow, re-did the eye(although not much a difference), and drew the snacks on the side. I really like the color mix, textures and especially his pose. Just one thing though. I think the eye needs a little bit more attention: brighter colors, and more details. But the rest is perfect! wow! this really looks natural, though in the snickers' part, it would need some shadows as well..
Oh this is so nice vectored,i love so much these colors,very pretty idea and super job. head is agito, body is ritsuka from loveless. 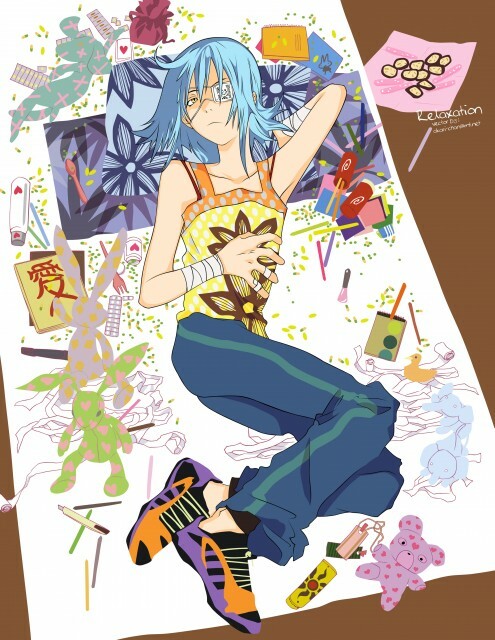 coll i love air gear it wonderfull !